In the adjoining figure, a metallic block of volume 20 cm3 is shown suspended, using a thin nylon string, from an independent support. The entire block is immersed in water in a beaker, without touching the sides of the beaker. The reading of the electronic balance (on which the beaker is placed) is 257 gram, as shown. If the weight of the beaker is 37 gram, what is the weight of the water in the beaker? Since the metallic block is completely immersed in water, the force of buoyancy on the block is equal to the weight of 20 cm3 of water displaced by the block. In other words, water exerts an upthrust equal to the weight of 20 g of water. The block exerts an equal force downwards (reaction force) which the electronic balance registers in addition to the weight of the beaker and water. 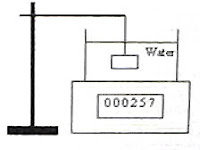 The weight of the beaker and water together is therefore 257–20 = 237 g. Since the weight of the beaker is 37 g, the weight of water alone is 237–37 = 200 g.
Now, suppose the block was kept immersed using a rigid support instead of the string. Then also, the same explanation holds good. If you dip your finger gently in the water in the beaker, the reading of the balance will increase since the water exerts a force of buoyancy on your finger and your finger exerts an equal and opposite force of reaction. Therefore, mass of iceberg = 900×3 = 2700 kg. A solid sphere of volume V remaining submerged in a liquid of density σ is lifted through a height ‘x’ within the liquid. If the density of the material of the sphere is ρ where ρ > σ, which one of the following statements is correct? You will have to exert a force equal to the apparent weight of the sphere for lifting it. The apparent weight of the sphere is Vρg – Vσg = V(ρ – σ)g. The first term is its real weight and the second term is the up thrust (force of buoyancy) on it. The work done in lifting the sphere through the height ‘x’ is V(ρ – σ)gx and this is the increase in potential energy of the sphere. More questions from Fluid Mechanics will be discussed in the next post. Meanwhile see a useful post in this section here.